Not to be confused with World 1-1, Level 1-1, or Area 1-1. 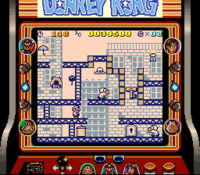 Stage 1-1 is the first actual stage of the Game Boy version of Donkey Kong, and the first level of Big-City, the first world of the game. In the stage, Mario sets off to rescue Pauline from Donkey Kong. At the beginning of the stage, Donkey Kong runs off with Pauline into a building, and locks it. Mario's goal in this stage is to find a Key to unlock the door. The level starts with a Trash Can which sits on the foundation of the level, right next to a ladder. A Bowbow lumbers in a further place, near the locked door of the stage. The mentioned ladder connects the ground with a girder platform, which is, in turn, connected with another larger platform through another ladder. Up next, on the second platform, ascends and descends an Oil enemy - a Hammer sits near it. The hammer seems to host a long ladder, which grants the hero new, high-placed platforms. To the far right, there is a narrow pit, whose walls prevent the key of the level from falling. A girder platform stays right under the key, and underneath the platform, sits the level's foundation with the locked door. Mario then must grab the key then take it to the door to end the level. Hat: Right above the second Bowbow in the level, which stays on a girder separated by the second lowest platform from the left through a small slit. Parasol: Above the left highest girder. Bag: Stays in front of a window above the third highest platform from the right. This page was last edited on September 7, 2018, at 02:37.